Every parent is concerned with providing for his or her child’s future. We want to feel secure knowing that if anything were to happen to us, our children would be taken care of. This is why many parents choose to invest money in different ways. Some parents will put money into bonds, while others invest in stocks, all with the goal of having earned enough money in the future to assist your children. We know that money may be tight, and that you may be looking for ways to trim your budget, but investing for your child is always a good idea. Maybe you want to be able to pay for their college, or their wedding, or simply guard against some unfortunate accident. No matter the reason, investing for your child’s future is a smart idea, and the best way to do that is with precious metals. Raising a child isn’t cheap, and as they get older you are going to wish you had money saved away to assist them. Things like a college education are expensive, but if you start planning ahead early enough, the expenses can be manageable. 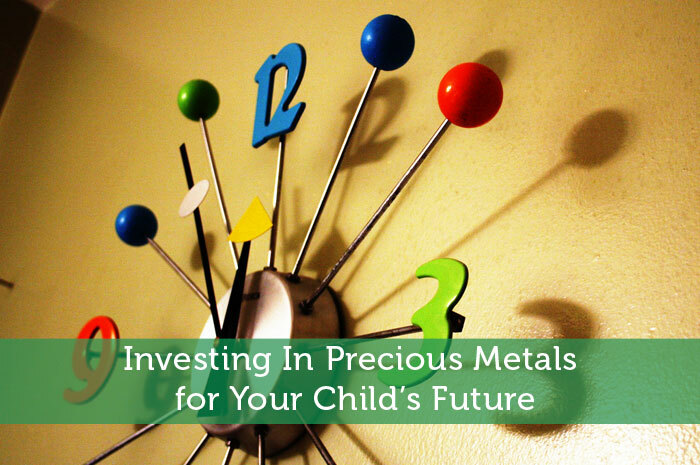 Many parents who are looking for good ways to invest their money, with their child’s future in mind, choose precious metals. Precious metals are a wise investment for several reasons. The first reason is that unlike other forms of investment, such as stocks or bonds, with precious metals you are investing in a physical product. And since there is a limited quantity of these metals, their value will continue to rise as the amount of them shrinks. In addition to this, investing in precious metals allows your portfolio to have international appeal. This means that even if a certain country’s economy sinks, you are still protected because your investment is outside that government. This is different than if you had, as an example, an American bond. That bond is only really good in the U.S, but precious metals are a commodity everywhere. So what kind of precious metals can you invest in? For starters, you can invest in gold. Gold is what most countries base their currency value on, and it is one of the more common investment strategies. If you don’t want to go with gold items, another option is to invest in silver. Investing in silver is much the same as you would in gold; however the prices tend to fluctuate more. The price of silver largely depends on the current market for it, and how in demand it is. Lastly, your third option is to invest in platinum. Like gold and silver, platinum is traded at all times on global markets. Platinum tends to have a higher cost than gold, due to the fact that it is rarer. Each one of these metals has its own advantages and disadvantages, so if you want to invest in one of them, we suggest you research it as well as you can first. If you do so however, you will most likely find a very good investment opportunity that will help you to secure your child’s future. Don’t wait until it is too late to start securing your child’s future. Saving up enough money for the goals you have in mind, or to protect loved ones should something happen to you, takes time and a decent amount of planning. Whether you have other investments already in place for your child, or if this is your first time exploring it, precious metals are a good avenue to analyze. The only thing more precious than these metals is your child’s well being, so get started as soon as you can. When I had my first child, that’s the time I realized that it’s better to secure a better future for her. I joined in stock market and started saving for long-term goals. I am satisfied that I have started and I know that a brighter future is coming. We do have some gold and silver, however we did not when our son was growing. We have the precious metals more as insurance rather than an investment because we know how volatile it can be. We watched it go from $900 where we bought up to over $1700 and now back down to where it is now. For us it is a hedge. For our son’s college we invested in CDs, bonds, and mutual funds. Those items served us well at the time.